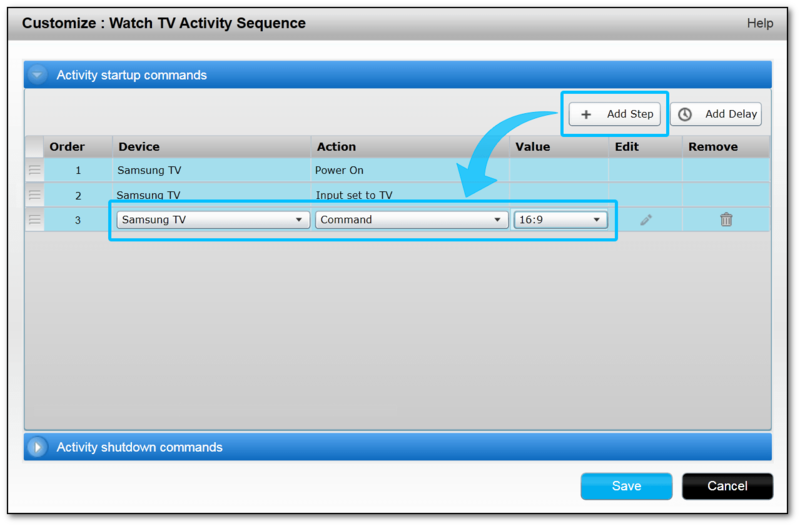 Harmony allows you to configure additional commands to send when an Activity starts or stops. For example, you may want to send 'eject' to your DVD player when you start a Watch a Movie Activity so that you can easily insert a DVD. Select MENU > Harmony Setup > Add/Edit Devices & Activities > ACTIVITIES. Select the Activity you wish to modify followed when you would like the step added (e.g., START). Scroll down and press EDIT. Scroll down and press ADD A STEP to add an additional command to a device. To add a pause between the sending of commands, select ADD DELAY. 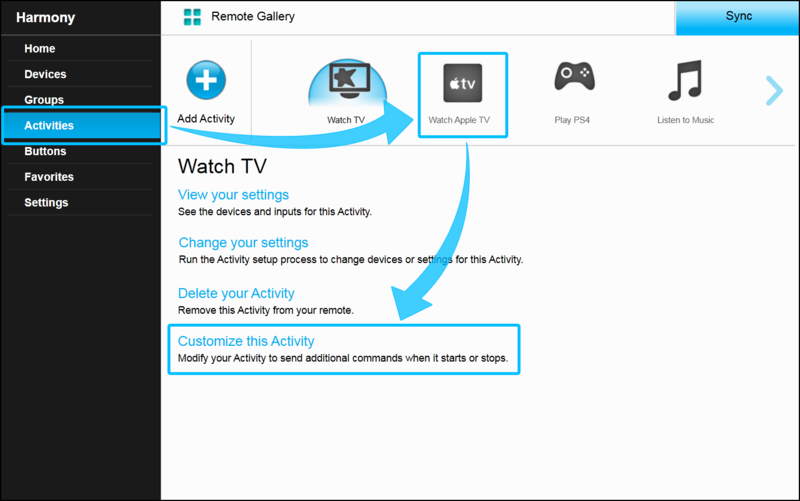 Select the Activities tab on the left side of the screen and select the Activity you would like to customize (e.g., Watch TV). You can send different commands when an Activity starts (startup commands), and when it ends (shutdown commands). Toggle between the two by clicking either the startup or shutdown bar. Select + Add Step and and select the device and command that you would like to add. To add a pause between the sending of commands, use the + Add Delay button to set the delay duration. Remember to sync your remote after making any changes. Power or input commands cannot be used in Activity customization as this may interfere with Harmony's Smartstate technology. Activity customization commands may be reordered amongst themselves, but cannot be moved into an Activity's power or input sections.